I received an unsolicited email from a business development manager and within the space of a few minutes a couple of follow-up calls. This person was trying to book me an appointment with a so-called UK qualified financial expert who apparently provides independent advice. This expert is apparently licensed to advise on investment and insurance products. 1. Very few if any Holborn Advisors would be qualified to advise on investments in the UK, this is a complete fallacy. Most only have the minimum level Certificate in International Wealth Management, a single module course from the CISI that anyone with half a brain, a few days study time and a calculator could pass. Many don't even have this. 2. Holborn Assets are not independent, they sell one white-label saving plan which they market under the name Holborn Assets Retirement Plan (HARP), and one lump sum investment product, which investors only get a choice of investing into 3 core holdings - their own broker funds. These products are both supplied by Royal London. Holborn receive volume override commissions on these products (they get paid more than all the other brokers) because they are tied into exclusive agreements. And they also receive a healthy commission on their own Old Broad Street broker funds of course - regardless of their appalling performance! 3. They advertise on the radio that they do not cold call. Cold calling for the solicitation of financial products is illegal in the UAE as they surely know this and yet still conduct telemarketing within the UAE and across the Global. I would like to know how they managed to obtain my private email address, my phone number and then contact me unsolicited? 4. If their financial salesperson is indeed a UK qualified expert, and intentionally making the claims above then he/she is actually deliberately mis-selling the public and also guilty of misrepresentation. 5. 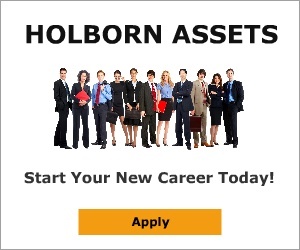 Holborn Assets like to slate all the competition saying they are the most professional, qualified, etc, etc, etc. They even contact clients of other brokers with misleading scare tactics, trying to disturb people to switch to them - this is hardly exemplary of the kind of "strong Christian ethic" they claim is at the foundation of their principles. 6. On the message from the CEO on their website, it clearly states that they are regulated in all the countries they do business in. This is again a total fallacy - they do not even have a license in the UAE where their head office is! Review #604389 is a subjective opinion of User604389. an Adviser who works with Holborn I sometimes read these comments and think there is no point in answering them because we all know who posts them. However, I simply cannot listen to this tripe any longer..
Of all the advisers within Holborn Assets ‘Most” (probably 95%) are qualified to give advice on UK investments, products etc. Those that are not qualified would not be allowed to advise you. They are most likely trainees or working within practices. They will have taken an entrance style qualification to get them on their way to full qualification such as FAIQ or a basic CISI paper. If your initial contact is with one of these trainee or practice advisers then that would be purely for information gathering and they might advise you on elements of financial services that they are qualified for. Any other advice would be given to you personally by a fully qualified adviser. Also, that adviser would put that advice in writing and put their name at the foot of that advice with their own signature. This is wildly inaccurate – Yes RL360 are one of the companies Holborn represent and yes, we have a white label product with RL360. Firstly, this is because RL360 value Holborn Assets and understand that we have a commitment to giving the best advice available. Ask yourself, why would a company like RL360 tie their global reputation to Holborn if they were not completely satisfied with the levels of advice, competency and compliance? The HARP product is very successful but it makes up only a percentage of the other products recommended by Holborn. Whether Holborn Assets gets paid more than another company on any product or services is debatable. All IFA’s will claim to have exclusive arrangements with at least one of the product providers. Some with Generalli, some with FPI and others with Zurich or OMI etc. It’s more down to the product providers than the IFA’s. Any increase in remuneration to the company would be from the providers own margins or profits and would not increase the standard charges to the client at all. We have our own small fund range and we encourage its use however there are hundreds of other funds being recommended every year by Holborn Advisers. It is understandable that we may incentivise our funds use, just as any other company would with any other product they create. The point you are missing here is that if the fund is not suitable for a client, it will not be advised to the client. Compliance would see to that in a heartbeat. Secondly, Holborn Assets also represents, Generalli, Zurich, Friends Provident Momentum, Brooklands and OMI; among a host of others, where they and we hold a license to do so. There is an almost equal spread across the board on the products advised from Holborn Assets. 3. Unsolicited contact or not: Cold calling is illegal in the UAE and marketing of financial services products is always a tricky one for IFA’s globally. I cant answer where your details may have come from but I can tell you this, I personally have many clients that have praised the fact that a particular problem or challenge was brought to their attention and that we were able to satisfy that need for them. For every one that is happy there will be another that is not; clearly where you fall. However I would rather help one family by providing life assurance or other crucial products than have missed them altogether. If you have everything in order – and I seriously doubt it – then carry on and ignore us. 4. Misrepresentation: See all the other replies I have made. 5.
Business and / or Christian ethics: Stating that we believe we are the most professional, most ethical company in the market place is not “slating the competition”, it is simply stating what we believe to be a fact. Just like any company in any industry we have a belief that we are darn good at what we do. Apple never became one of the richest companies on the planet by saying “we probably make fairly good computers”. They have belief in themselves just as we do. And, if stating to a client that they are literally paying two or three times what they need to on a certain product or service is going against business principles (never mind Christian ones), then there is something very wrong with your view of business, financial services or just the world in general. 6. Licensed and Regulated: This one is my favourite – You obviously know where our office is so why don’t you pop over and ask to see our licenses (plural) for the UAE. Whilst you are at it, you could ask to see the UK FCA license, the Dublin European License, the South African license etal. Finally, I highly suspect that these comments were written; like all on this site, by upset and disgruntled ex-advisers of Holborn Assets. It’s plain to see that there is at least a shallow understanding of the market place in your tone and the language used in your review. It takes a lot to fail at Holborn Assets, there is support both emotionally, professionally and where required financially. There are training programs, we pay for the exams that you claim nobody qualifies in, and there are splendid offices around the world and lots of other support programs. If you failed with Holborn its most likely because you could not sell what you wanted to sell such as unregulated funds or high commission paying funds, you were unethical or you just hate being professional. Or maybe, you could not keep up with the examinations and qualifications required to maintain your position at the company. It is also possible that you interviewed with Holborn and were rejected and now you are facing stiff competition for your services. Either way, I think any potential client should meet with an adviser, visit their offices and even ask to see the license or the adviser’s qualifications and they can make their own minds up. That goes for any financial advisory firm anywhere in the world, not just Holborn. i cannot agree more with this post. Everything this shell looks to be they are not. They are the worst and most dishonest in the world. I lost everything by trusting this Christian ethic and they won't even respond to my complaints. They are liars plain and simple and the crooks that run it are set to disappear into the sunset. Never ever deal with these liars or trust them.